Take advantage of the Mortgage Credit Certificate MCC in Colorado when you are purchasing a home! This little-known program will give you a direct tax credit as a percentage of your mortgage interest each year. This is not the same thing as the federal mortgage interest tax deduction. 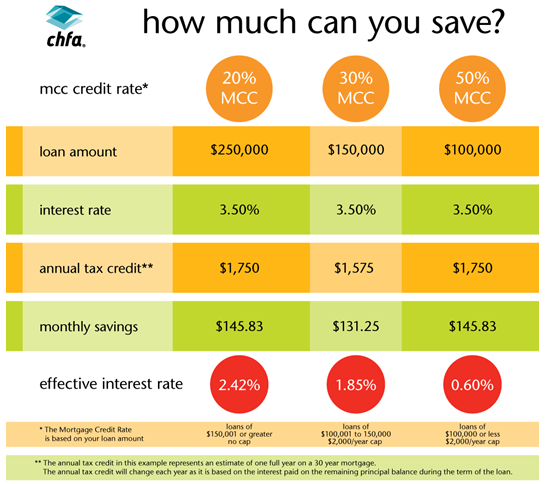 The MCC is a direct tax credit, meaning that if you have, for example, a $3500 tax burden in a given year, and your MCC credit is $2000, you would reduce your tax burden to only $1500. In order to take advantage of the Mortgage Credit Certificate MCC in Colorado, you must go through a Colorado Housing Finance Authority certified lender such as Team Baxter at WJ Bradley Mortgage. We can help guide you through the process and ensure that you can take advantage of this valuable program. Additionally, the table on the right shows the effective interest rate you will have on your mortgage. By being able to write off a percentage of your mortgage interest each year, your mortgage rate is reduced substantially! To take advantage of the Mortgage Credit Certificate MCC, just give us a call in the office or send us an email, we would be happy to answer any questions you have!